CABOT — At the Cabot Panther Relays Tuesday, Bryant senior Alexis Royal scored 41 points[more] to lead the Lady Hornets to their fourth consecutive meet championship of the season. Bryant athletes won 10 of the 17 events to post the winning team score of 169 points. Cabot finished runner-up with 151 points followed by Jonesboro (91), Conway (81), and LR Central (42). There were 10 teams competing. Royal won her 14th high point award of her high school career. She took first place in the 300-meter hurdles (46.5), long jump (17’9”) and the triple jump (36’8”). She ran the anchor leg of the winning 4 x 100-meter relay and also added a second place in the 100-meter dash (12.7). Junior Melinda Murdock and sophomore Feniece Boone each scored 23 points. Murdock won the 100-meter hurdles (15.6) and the 800-meter run (2:17.8). Boone took first in the 400-meter dash (58.1) and the 200-meter dash (25.2). Both were also members of the 4 x 100-meter relay that took first. Junior Leah Ward added 18 points. She took third in the 100-meter dash (12.8), fourth in the long jump (16’11”), and fifth in the 200-meter dash (26.5). She also ran on the winning 4 x 100-meter relay. Sophomore Jayla Anderson scored 15 points. She finished second in the 300-meter hurdles (48.0), fourth in the 100-meter hurdles (17.1), and eighth in the high jump. Bryant’s 4 x 100-meter relay team of Murdock, Boone, Ward, and Royal set a new Bryant school record with first place time of 48.7. The Lady Hornet’s other winning performance came from the 4 x 800-meter relay. Talyn Billins, Sam Macchi, Caitlyn Bell, and Gabby Crabtree ran 10:37 to take the title. “What a way to finish off our regular season,” declared Lady Hornets coach Danny Westbrook. “Our big point producers did their job but we also had some very impressive performances from people that have not been in the results before. This was a total team effort. We scored in every event. 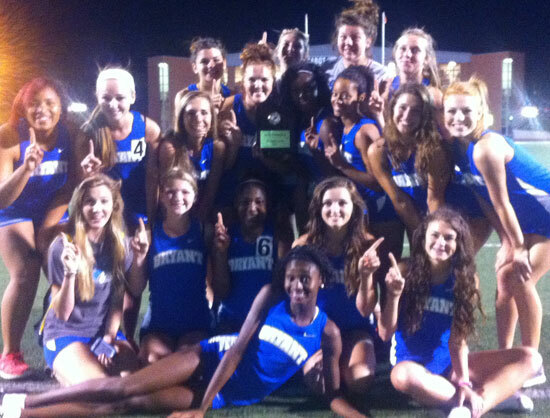 Next up for the Bryant track teams will be the 7A West Confernce meet at Van Buren on April 25.